I love salted caramel. You love salted caramel. We all love salted caramel. Or most of us do anyway. It’s getting to the point where it’s unusual to see the word caramel not preceded by some salty adjective. But what if you could take that rich, creamy dark salted caramel and add some notes of umami? 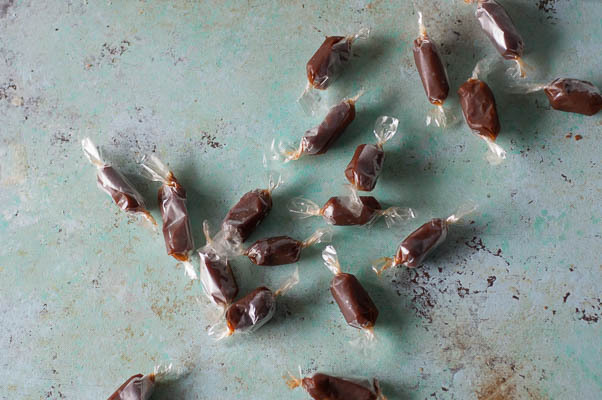 Enter miso caramels. They are the simplest of the desserts I recently made for our friends’ wedding. Though they are simple to make, their flavor is complex. 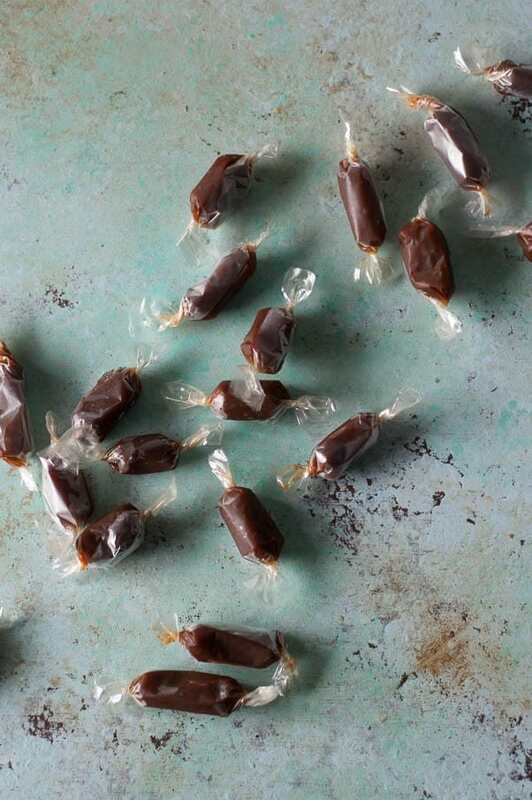 These are soft, chewy caramel candies with a deep, dark caramelized sugar flavor and a surprising salty savory quality from white miso that balances out the sweetness. These are adapted only slightly from Christine Gallary who you may know better as the food and cooking editor for The Kitchn. Lots of people are intimidated by candy making. But the truth is that making caramel candies like these is easy if you have everything prepped and you have an all-important thermometer. You line a pan with parchment paper, melt the butter and warm the cream, heat the sugar and glucose/corn syrup in separate sauce pan, add the butter and cream, heat again, and then whisk in the softened miso at the end. Then you pour everything into your lined pan and let them chill before you cut and wrap them. I think these would make an excellent grown-up Halloween candy (which doesn’t mean you can’t enjoy your fun-size Reese’s Peanut Butter Cups and Snickers Bars, too, if that’s your thing). This comes together quickly, makes a ton of caramels, and keeps well for weeks. So make them now and you’ll be all set for a party. 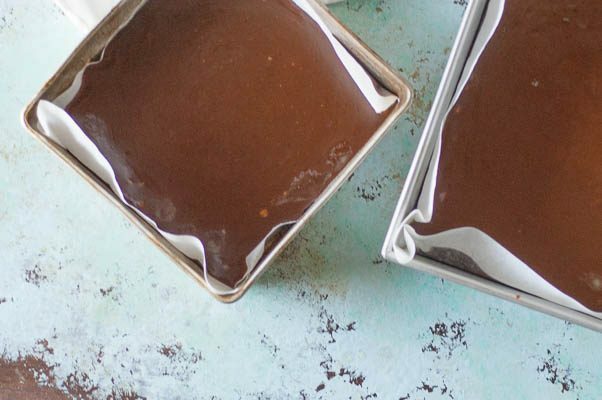 These miso caramels have salty and savory notes that help to balance the rich sweetness of caramels. 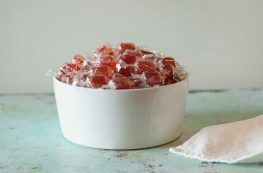 You can use glucose syrup or corn syrup here, but you can’t leave it out or substitute honey or maple syrup–it’s an essential part of getting the right texture for these candies. Use white miso (also called shiro miso) for these. If you want to make them gluten free, be sure to choose a gluten free miso paste (some contain barley malt, which contains gluten). You’ll need a candy thermometer and a light colored, largish sauce pan. 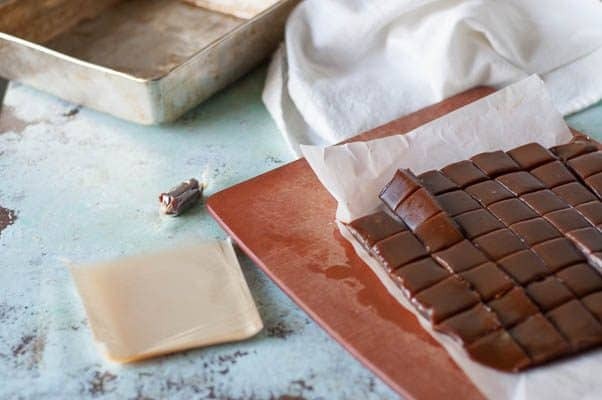 While these come together quickly, it’s essential when working with candy to have everything ready to go and pay close attention to the temperature because caramel goes from pleasantly caramelized to unpleasantly burnt very quickly. I used clear candy wrappers for these, but you can also cut squares of wax paper and wrap them that way. This makes a lot, but they keep for a long time in the refrigerator. Bring them to room temperature before serving. 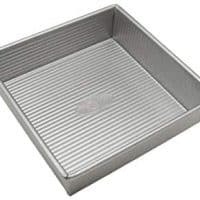 Line an 8-inch square baking pan with a sheet of parchment paper. Crease it carefully along the edges and in the corners, but leave enough overhang to work as handles later. Spray with nonstick spray. In a small saucepan, melt the butter and warm the cream over medium-low heat until the butter is melted and the mixture is warm to the touch. Remove from heat and set aside. 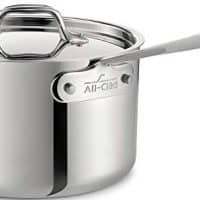 In a large (3 quarts or larger), light colored sauce pan, heat the sugar, glucose or corn syrup, and water over medium-high heat. Bring to a boil and cook, stirring occasionally, until all of the sugar is melted, about 5-6 minutes. Clip a candy thermometer to the pan, and continue heating without stirring, until the mixture reaches 360ºF and is a medium amber color. Remove the pan from the heat and slowly pour in the cream and butter mixture. It will bubble up, don’t worry, that’s why you used the roomy sauce pan. Stir in the cream until the mixture is uniform. Return the pan to the stove and and cook (without stirring) over medium-high heat until the mixture reaches 250ºF. Remove the pan from the heat and the thermometer from the pan. Quickly whisk in the miso until no lumps remain. Pour into the prepared baking pan. Place the pan on a wire rack and let cool overnight. Then transfer to the refrigerator for an hour or more until it is firm enough to cut. 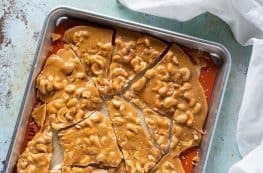 Using the ends of the parchment paper as handles, pull the caramel and parchment from the pan and transfer to a cutting board. Cut the caramels into 1-inch squares. Wrap in candy wrappers or wax paper. Store in the refrigerator, but bring to room temperature before serving. They keep for at least a month in the refrigerator. 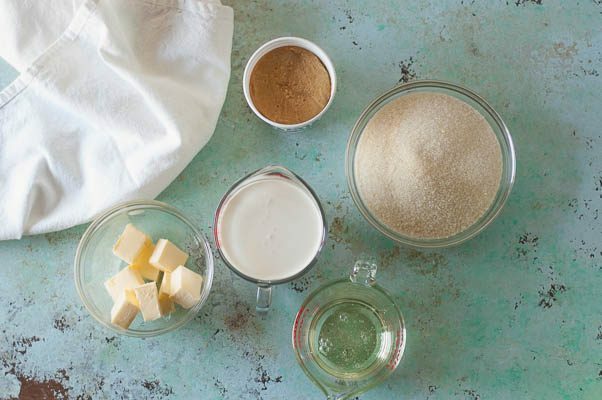 I haven’t made them with brown sugar, and I’m not sure it would work without altering the method. Caramelizing brown sugar is a bit dicey–takes on a burnt flavor more easily. I totally understand not wanting to buy more pantry items before a move, but I don’t want to steer you wrong. I love salty sweet things! ! My weakness! It’s one of my weaknesses too. Yum…. I love caramel candy. I love ’em sticking to my teeth 🙂 Now with the edition of miso makes it very interesting. I want to just grab one. Thank you! I love caramel candies too. Just when I thought caramel candies couldn’t get any better! Thanks, Noel. I love this combination. Now I’ve made caramels, but never miso flavoured – I am intrigued. LOVE! Thanks, Jacquee! I love this combination–sweet, salty with something more. Holy macaroni, this is a great idea. I think there’s an untapped world of caramel flavors out there and you’ve just opened a door. Great recipe, Mary! Thanks, Sarah! I love using caramel with unexpected flavors. Passion fruit caramel is another favorite. 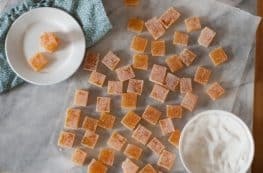 Miso caramels? Genius idea, I would have never thought to put miso with a sweet! Thanks, Adriana! I love the way miso balances sweet flavors. Dalia, with a thermometer and a little bit of prep, caramels are pretty easy to pull off. I hope you give it a try! I adore this idea, I can actually eat sweet white miso with a teaspoon or squeeze it to my mouth directly from the packet! Helen, if you’re a white miso fan, then these should be right up your alley. Oooh! These exotic caramels may just give me the nudge I need to whip up my very own batch of caramels (it’s been on my list for some time). They look and sound absolutely divine! Lynn, I hope you give it a try! It’s really pretty easy. Miso caramel sauce on an apple walnut tart sounds amazing! I agree that these would make great Christmas gifts (they keep well and travel well, which make for good edible gifts in my book). this sounds awesomeeeee! I’ll include them in my Haloween soiree candies! Thanks, Claudia! I hope you do. I’ve only ever tried to make caramels once and it was a disaster…burnt sugar everywhere! So I’m thinking I’m going to try out your recipe and see how it goes! 🙂 Especially with miso…what an interesting flavor combination! Thanks for sharing! Ariel, I’ve messed up caramels too (I ended up with a tray of rock hard candy–maybe good as toffee, but not what I was going for.) The keys to making caramels are using a large saucepan (it really bubbles up when you add the cream) and keeping a close eye on the thermometer. Things go from caramelized to burnt pretty quickly. Ooooh, I LOVE the addition of the miso here! Bet it adds a nice umami flavor to it! Thanks, Lisa! It really does. Oh my gosh! These sound amazing!! Thanks, Pam! I think they’re something special. Wow! I am so impressed by these, what a great combination of flavors, they sound so interesting, sharing this recipe! Thanks, Sara! I love these.